Let’s make a better environment for our children! Since our founding in 1993, Fast Haul has always had a Green Business philosophy. As one of the Bay Area’s oldest junk removal/trash hauling companies, practicing recycling, re-use, and donation come naturally. It makes our customers feel good as well as keeping costs down and reducing our landfills and dumps. The Bay Area trash dumping rates range from $75 to $135 per ton (depending on which disposal site is used). Every pound of material that Fast Haul can recycle is a cost savings that is passed on to our customers (10% discount mentioned in the green box on the left) for any load containing over 25% recyclable material. This is a win-win for our customers and us. The 3rd win is for our planet. Recycling is good for Mother Earth! 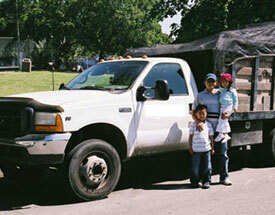 Fast Haul works all over the San Francisco Bay Area and uses many recyclers depending on what city our job brings us. One of our favorite locations for example is in Berkeley. Just before the entrance into the dump, there is a recycling center where any paper, cardboard or metal can be dropped off and recycled, thus reducing the weight of the truck and the amount of money Fast Haul pays for junk disposal. This is the type of things that allows us to pass on savings to our customers. Many household items such as cell phones, TVs and computer monitors contain harmful materials like lead, mercury or cadmium. These items cannot be disposed of with regular trash loads and must be taken to a special hazardous waste recycle center. These centers are spread throughout the Bay Area. Fast Haul picks up e-waste and disposes of these materials in a responsible manner. One such drop off center we like to go to is Alliance Recycling Co. at 3426 Peralta Ave. in Oakland. This electronic recycling center also accepts all metals, paper and cardboard for recycling as well as e-waste. Fast Haul usually provides electronic waste recycling at no additional cost to our customers when e-recycling is part of a junk removal job. We also do pickup e-waste only but we do charge for this service. Large TVs and oversized computer monitors always have a surcharge based on the size of the item and access. The re-use centers take trash and construction debris from junk removal companies like Fast Haul resell the base components on the open market where they eventually become consumer goods one again, thus keeping them out of our landfills and dumps. These re-use items are usually salvaged from garage cleaning, basement cleaning, and construction site cleanups. In an average month, we recycle approximately 6 tons of paper/cardboard products and scrap metal. Again, items that are kept out of dumps and landfills resulting in a reduction of carbon emissions. Why choose Fast Haul Green Hauling? Illegal, non-licensed drive by and “Home Depot” type haulers are very likely to dump your trash on the street! They have no traceable address and it’s extremely difficult to hold them responsible for illegal dumping, which is a serious problem in our cities. It costs taxpayers millions of dollarsto deal with the ongoing problem. Often times the police will sift the illegally dumped trash for an address and come back to present the proprietor with a large bill for the cleanup. These illegal haulers will not refuse to haul hazardous paints and chemicals, which may be dumped on the street or in a landfill; such a problem is commons in areas like Richmond, CA which is close to the Bay of San Francisco. The paints and chemicals find their way into the Bay waters, becoming a dangerous threat to marine life and the entire Bay Area environment. As one of the leading Bay Area junk removal companies, Fast Haul will continue to lead the way in the green hauling field with our eco-friendly outlook and business attitude, thus preserving our planet in future generations. We support Green Charities such as: National Resources Defense Council, the Rainforest Foundation, the Natural Conservancy, the WWF, Save the frogs and Rainforest Concern. We regularly donate to Good Will Industries, Salvation Army, local homeless shelters, Habitat for Humanity, and Urban Ore.
Last month we recycled over 6,000 pounds of metal and paper trash, and donated many items to local charities.